This consists of all 8 pages of original art drawn for the story Cayo Romano, Cuba! 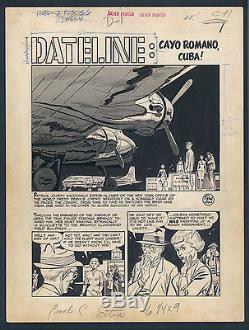 From Extra # 1 (1955 / EC). This art is penciled and inked by Johnny Craig. It's drawn in a smaller format, with an art area of 8+3/4" x 12". It's in very nice, clean shape, with some very minor touches of whiteout. On the left side of the bottom of page 6, there is an original art panel pasted over other original art. WE HAVE LOTS MORE ARTWORK ON OUR WEB SITE. The item "JOHNNY CRAIG BEAUTIFUL ART! ESPIONAGE" is in sale since Monday, June 24, 2013. This item is in the category "Collectibles\Comics\Original Comic Art\Complete Stories".